Tomorrow, I believe I'll do a post or two on the subject of modern-day troglodytes (cave dwellers). You'll be suprised to learn how many people live underground! I'll start off the fun with this lovely little cottage built into a English cave. Though it doesn't have running water or electricity, it recently sold at auction for more than $200,000! 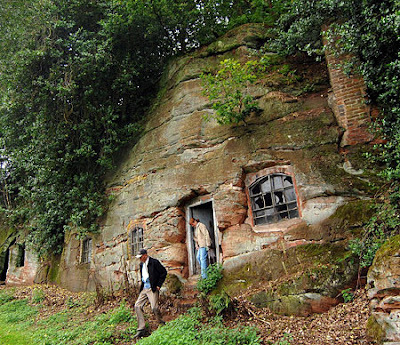 It's one of many "rock houses" in the area around Wolverley, Worcestershire. You can see pictures of some of the others here. I'd be a little creeped out by living *in* the side of a mountain...although living in a highrise several stories off the ground seems very apealing? Our culture, well my view of American society in certain aspects is a little wierd. It would be cool to 'rent-a-cave' for a summer house or something! thats so cool. I love it! I would totally live there. lol i know i'm odd. thats why u love me! Oh my. Better remember that! You anonymous poeples sure are funny!